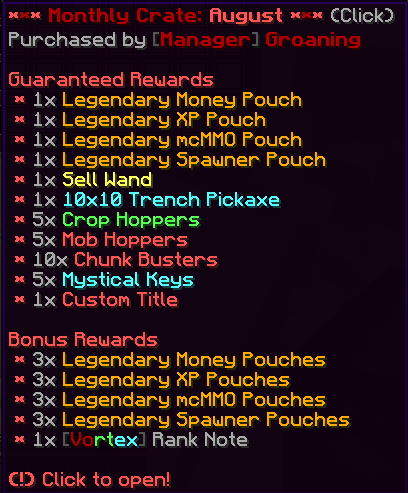 Announcement Vortex Updates, Bug Fixes and New Monthly Crate! 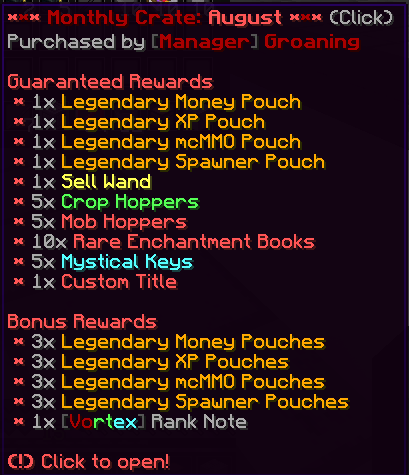 We have another server update full of bug fixes on the network and the new monthly crate for this month. Sorry for such a short update, There will be a bigger more informative one in the upcoming weeks so prepare for a huge content update. Here is the second monthly crate we’ll be releasing this time for August! We’ve introduced a few different rewards for this crate and hope you’ll enjoy it just as much as the first one. Did you forget what server this is?